SHERWOOD — It was a battle. An exciting back-and-forth battle, to be exact. Things looked to be going Sherwood's way. Then Tigard seemed to gain control. Momentum kept switching sides. And, when it came to the end, the Sherwood High School baseball team was celebrating a hard-fought victory. 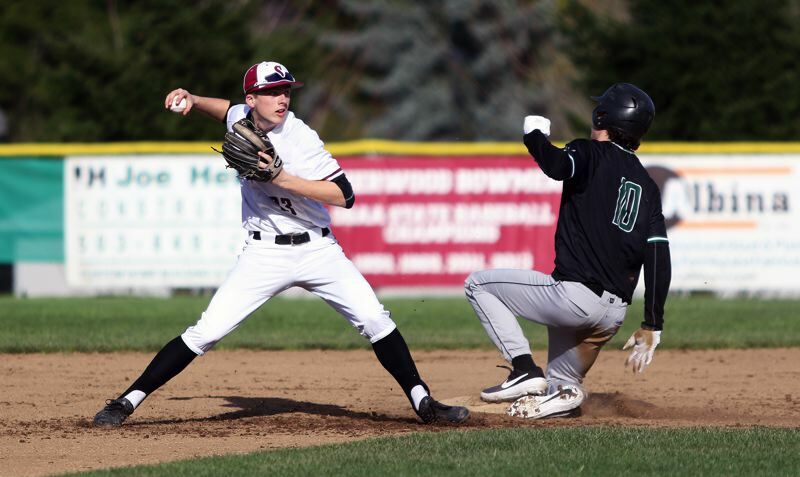 The Bowmen, with junior Sage Dunaway scoring what turned out to be the game-winning run with a shifty move right in front of home plate, scored a thrilling 5-4 win over the Tigers in a Three Rivers League game played Friday at Sherwood High School. "It was a lot of fun," said Sherwood senior Jacob Matzat, who was the winning pitcher in Friday's game. "It's always fun to come back and win. It's the best feeling." 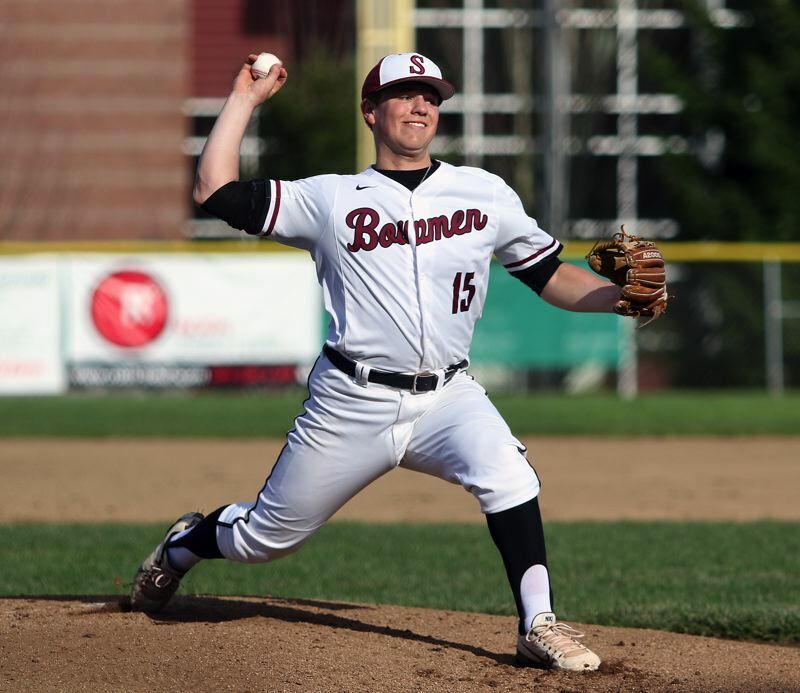 "Oh, it's pretty big, sweeping Tigard," said Sherwood junior Braden Thorn, who pitched the final two innings for the Bowmen to get the save. "They were ranked higher than us. So, it feels good to get the sweep." With the win, Sherwood, which opened league play by scoring a 2-0 win over Tigard in a game played April 4 at Tigard High School, improved to 2-0 in TRL play (7-2 overall) at that point. "It's pretty big," Matzat said. "It's good to get a 2-0 streak to start the league season." The Tigers moved to 0-2 in TRL games (7-4 overall) at that point with the setback. "We had a few too many mistakes," Tigard coach Tom Campbell said. "We swung the bats decently, much better than the first game." 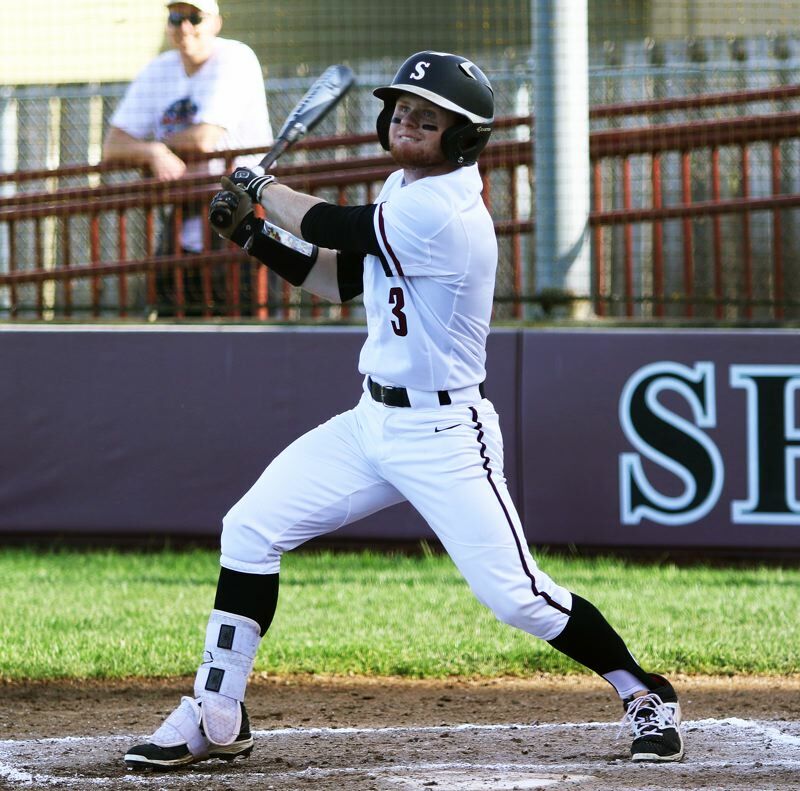 Sherwood, in Friday's game, struck first, getting a pair of runs in the bottom of the third inning. Senior Riley Aggson and junior Anthony Garrett had back-to-back singles to lead off the frame. Aggson then scored the game's first run on a groundout by senior Hayden Gilbert. 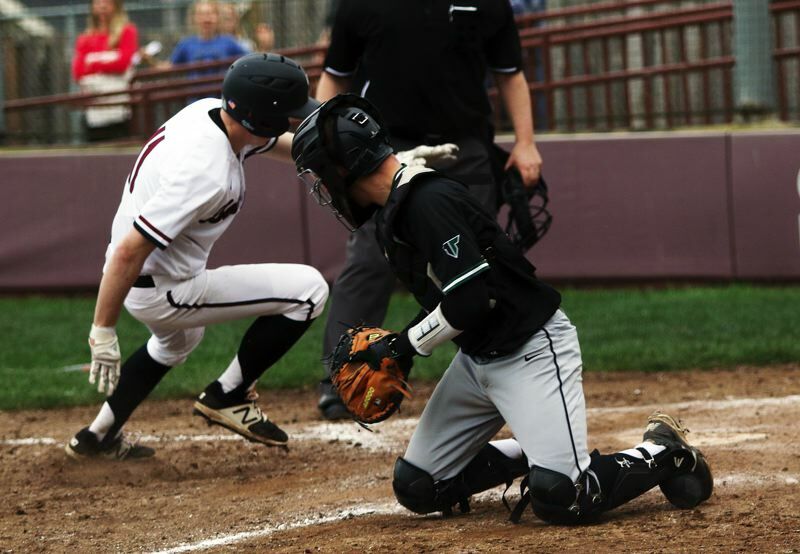 Garrett scored later in the inning on a two-out single by senior Bryce Vaughn to give the Bowmen their early 2-0 advantage. 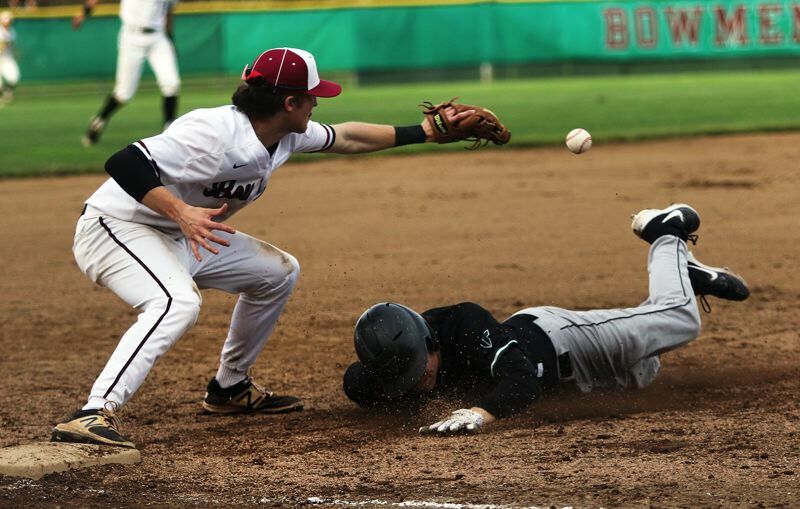 Tigard got one of those runs back in the top of the fourth. Tiger junior Lance Kreisberg hit a one-out double to center field and he scored on junior Caden Stinson's two-out double to left field, making the score 2-1. Sherwood answered back in the bottom of the frame. Junior Tyler Hix drew a leadoff walk and eventually scored from third on a two-out wild pitch, giving the Bowmen a 3-1 lead. But the Tigers came storming back in the top of the fifth. Senior Sam Pittmon got things going with a leadoff walk. Pittmon moved to second on a sacrifice bunt by senior Joey Cavalli and then he scored when senior Nick Heinke tripled to left field. Heinke then scored on a squeeze bunt by senior Michael Quintana, beating the throw to the plate, tying the game at 3-3. Tiger junior C.J. Rivers then plated Quintana with a double to right-center field, giving Tigard a 4-3 lead. But it didn't take long for Sherwood to respond in this back-and-forth battle. 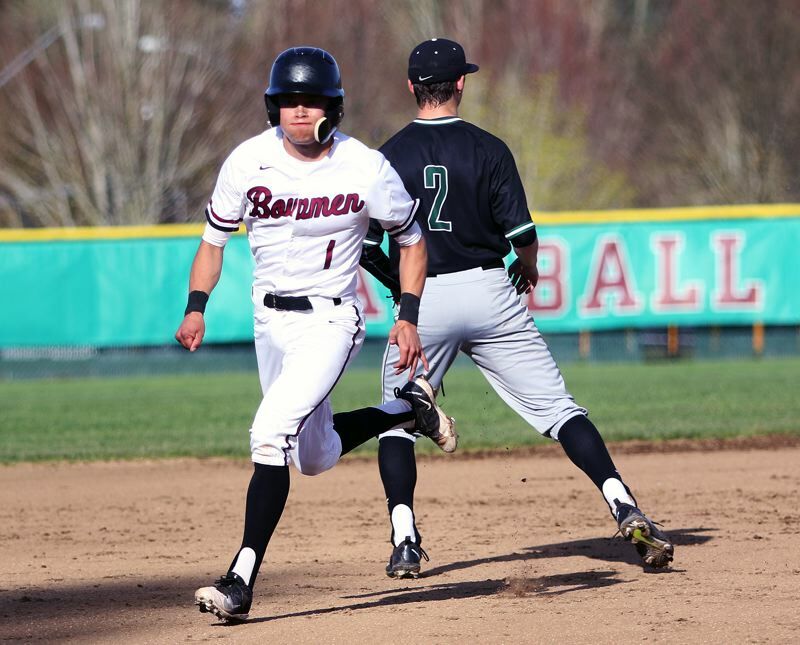 Bowmen seniors Nic Garrison and Takumi Kammerzell drew back-to-back walks to lead off the bottom of the fifth. Dunaway followed with a single to right field, loading the bases with no outs. 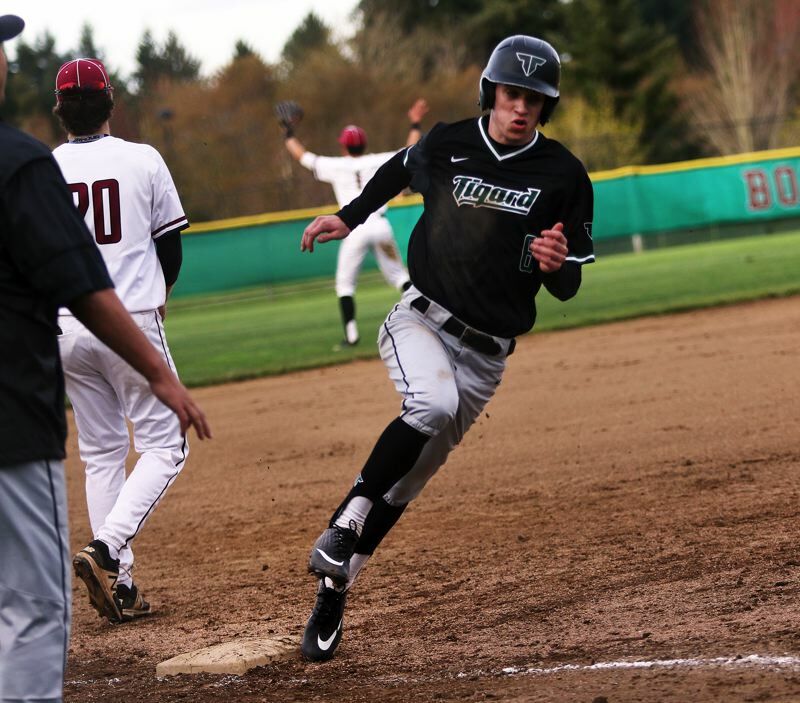 Senior pinch-runner Lucas Hughes then scored when Tigard committed an error on a grounder by Hix, tying the game at 4-4. The excitement then continued, as Kammerzell was thrown out at the plate trying to score on an apparent wild pitch, with Heinke making the tag after taking a toss from Cavalli, who quickly got to the loose ball. Aggson then hit a one-out fly ball to right field. Dunaway, tagging from third, broke for home when the ball was caught. It looked like the Tigers had a chance to get a second straight out at the plate, but Dunaway, making a quick move to his left, was able to avoid a tag, and touched home plate, giving Sherwood a 5-4 lead. "It was huge," Matzat said of the play. "It was just awesome. He made a great play." 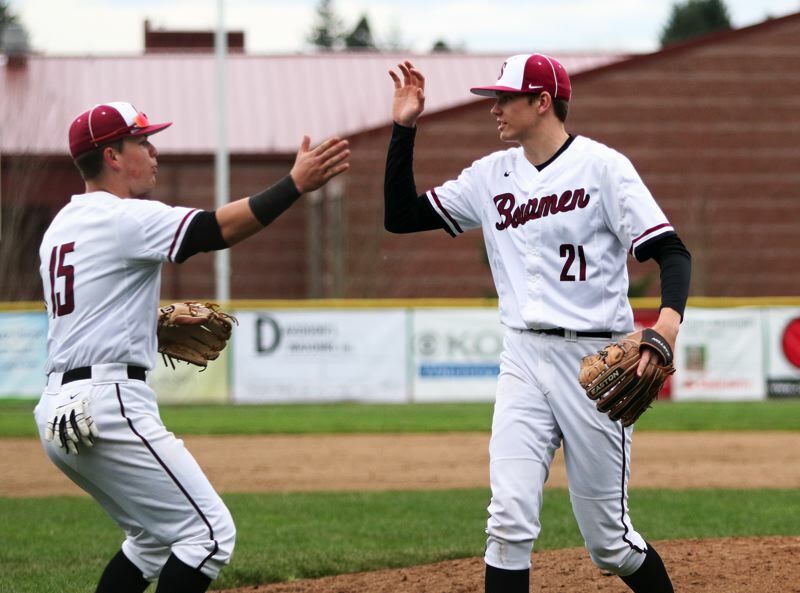 Thorn then shut the Tigers down over the final two innings, allowing just one base runner, to wrap up the Bowmen's 5-4 victory. "It was our energy in the dugout," Matzat said of the key to victory. "We were super loud. We always try to be the loudest dugout in the state, and it helps to have all that energy." "I think a lot of it was our energy," Thorn said. "We brought more energy than them." Matzat, in getting the pitching win, gave up four runs on six hits, while striking out three and walking two in five innings of work. Thorn, throwing the final two frames, gave up no hits, while striking out one and walking one. "Getting out there in the end was so fun," he said. "It felt good. I just tried to keep my tempo up and keep them on their heels." Sherwood, as a team, had 10 hits in the win. Garrett went 3 for 4 at the plate with a run scored. Garrison went 2 for 3 with a run scored and Vaughn went 2 for 4 with an RBI. Tigard got one hit apiece from Heinke, Quintana, Rivers, Kreisberg, Stinson and sophomore Ethan Clark. "Coming back like we did should give us confidence," Campbell said. In the first game of the teams' series, Aggson threw an eight-inning shutout for the Bowmen, giving up four hits, while striking out eight and walking none. Vaughn and Garrison had eighth-inning RBIs. Senior Manny Andrade pitched all eight innings for Tigard, giving up nine hits, while striking out two and walking one. Both teams picked up league wins on Monday. Tigard bested Lake Oswego 2-1 in a game played at Tigard High School. Rivers gave up one run on three hits, while striking out four and walking six in six innings of work. Heinke finished the game on the mound to get the save. Quintana and sophomore Fletcher Ahl scored the two Tiger runs. Sherwood picked up a 15-4 win at Canby on Monday. Garrison blasted a grand slam home run in that contest and drove in a total of five runs. Kammerzell had three hits. Garrett and Gilbert each scored three times. Garrett also pitched six-plus innings to get the win on the mound. 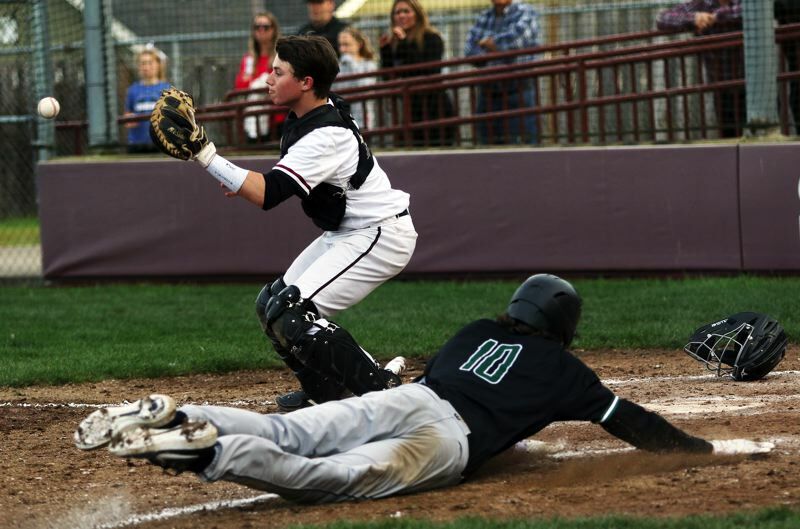 On Tuesday, Sherwood won 2-1 at home against the Cougars, sweeping another two-game league series. The win also gets the Bowmen off to a 4-0 start in TRL play. 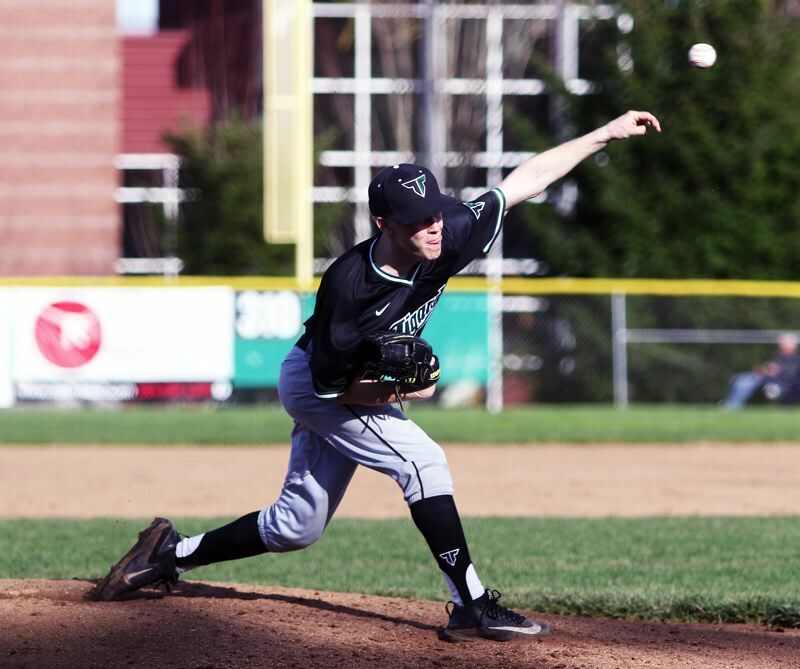 Tigard is slated to play at Lake Oswego Wednesday at 5 p.m.
On Friday, Tigard will host Lakeridge at 4:30 p.m. and Sherwood will play at Tualatin at 5 p.m.